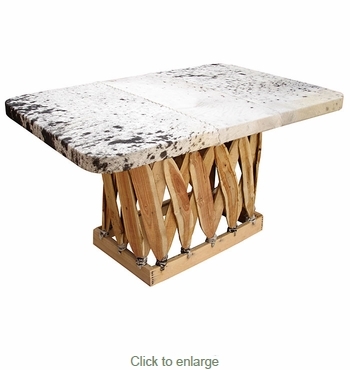 This equipale coffee table shown with cowhide top is also available with choice of 14 colors. This Mexican coffee table, hand crafted from pig skin and Mexican cedar strips, is stylish and durable. Equipale furniture will create a southwest or rustic atmosphere in any room of your home. Since each piece of Equipale furniture is handmade from all natural materials, expect slight variations in color and size.